Home » News » The Children’s Cabinet Network publishes the 2017 State Policy Survey: Child and Youth Policy Coordinating Bodies in the U.S. 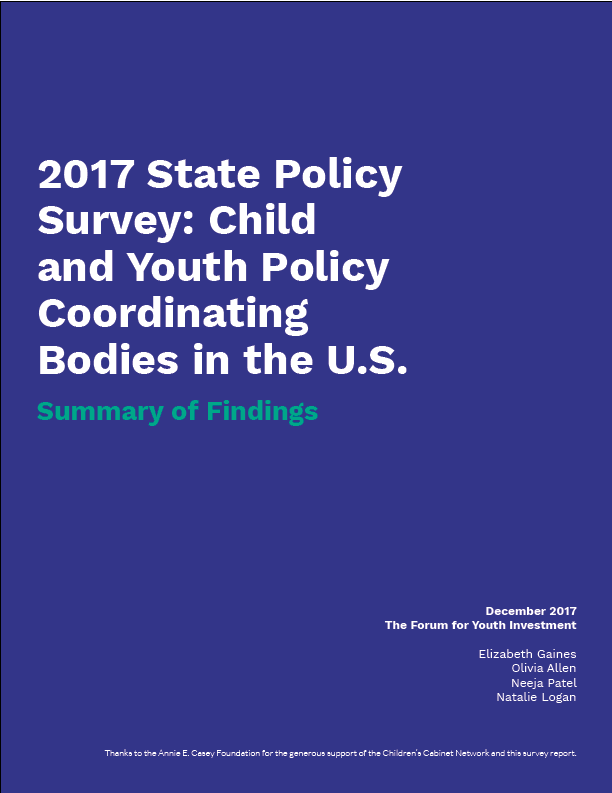 The 2017 State Policy Survey: Child and Youth Policy Coordinating Bodies in the U.S. is the nation's only survey of state child and youth policy coordinating bodies (i.e., children’s cabinets, commissions, P-20 councils and early childhood advisory councils). The survey assesses coordinating bodies in the areas of partnerships, goals, data, accomplishments and challenges. This biennial survey was conducted first in 2011 and then again in 2013, 2015 and 2017 in hopes that the decisions, lessons and experiences it documents can serve as tools for state leaders and coordinating bodies.